Outside of the mainline games, there are dozens upon dozens of Pokémon experiences. Some of them diverge slightly from the core formula, and others are entirely different. Make no mistake about it, the Pokémon franchise has produced a lot of duds that felt like cash grabs. Pokémon Mystery Dungeon series, anyone? But there are some Pokémon spinoffs that work quite well. Here are our favorites. An on-rails shooter about taking candid shots of Pokémon in their natural habits for Professor Oak? Sign us up. Pokémon Snap for Nintendo 64 focused more on the beauty of these magical creatures rather than their deft combat skills. We loved every moment of it, especially when we captured an absolutely perfect photo of a fire breathing Charizard. Pokémon Stadium brought our friends to 3D long before the mainline series when it launched on Nintendo 64. The game used the standard turn-based battling system, rendering all of your favorites from the original 151 in the glory they deserved. Working our way through the stadium cups and playing multiplayer against friends was a blast. The best part about Stadium, though, was the Transfer Pak. The N64 controller attachment let you insert your copy of Pokémon Red, Blue, or Yellow to use your personal collection in the game’s exciting 3v3 battles. Pokémon Conquest for Nintendo DS spun the Pokémon formula into a wonderful tactics experience. Set in the new Ransei region, it told a wholly original story filled with warlords and waging factions. While the turn-based tactics gameplay wasn’t as deep or challenging as games like Fire Emblem and Final Fantasy Tactics, it was a perfect introduction to the genre and contained all of Pokémon’s patented charm. You know the Pokémon Trading Card Game. The physical cards that took the world by storm in the late ’90s and early 2000s. Maybe you just collected and traded them amongst friends, or maybe you created your own decks and battled. Pokémon Trading Card Game for Game Boy Color took the trading card game and put it in video game form, complete with an engaging storyline and all of the nuances from the real thing. It was really, really good. If you’re feeling nostalgic or never played it the first time around, it’s available on the Nintendo 3DS eShop. Pokémon Go is the most successful Pokémon game of all time in terms of player count. The mobile sensation lets you, yes you, be a real-life Pokémon trainer anywhere in the world. Using AR technology, Pokémon pop up whether you’re walking down the sidewalk or hanging out in your own backyard. Pokémon: Let’s Go for Nintendo Switch is incredibly close to being considered a mainline Pokémon game. After all, it’s a largely faithful remake of Pokémon Yellow rendered in beautiful 3D visuals, complete with battling, the gym badge progression, and the Elite Four. Where Let’s Go differs is the act of catching Pokémon. Using Pokémon Go as an influence, a simplistic catch mini-game commences when running into a wild Pokémon. Let’s Go also depicts wild Pokémon roaming the overworld, so you always know what you’re getting into beforehand. Pokémon: Let’s Go is a wonderful melding of two types of Pokémon games. Pokémon Puzzle League is essentially just Tetris Attack with a different coat of paint, but it’s still one of the most entertaining Pokémon games outside of the main series. The game is simple: the player’s board is on one side of the screen with the opponent’s on the other. Both boards will fill up with tiles and players must rearrange the tiles to create lines of three or more in a row. Doing so will clear the tiles from your board and send blocks to your opponent’s, which they’ll have to clear out. The game is straightforward but challenging, and is particularly fun to play against another person. The presence of various characters from Pokémon also gives it a warm feeling of nostalgia. 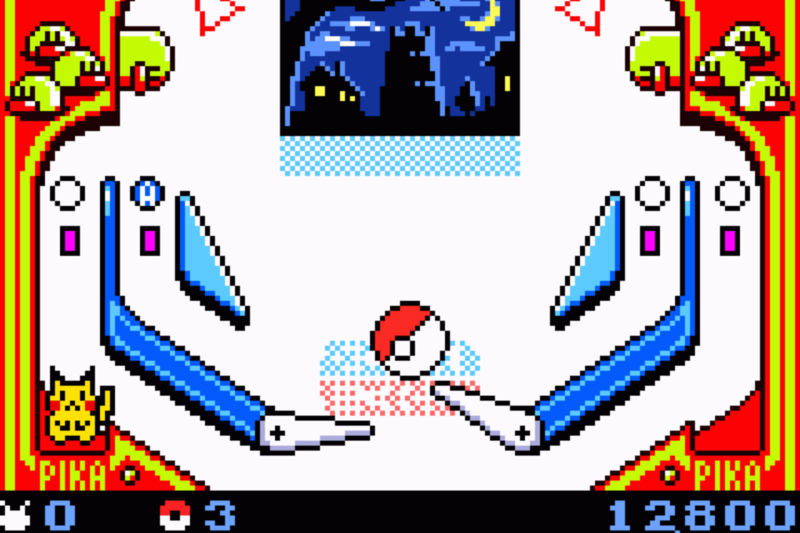 Pokémon Pinball for the Game Boy Color is a surprisingly addictive for a game with only two tables. Hitting certain objects on the table would cause a Pokémon to appear, and players could then catch them by hitting them with the ball multiple times before the time limit ran out. Despite the lack of features, The game was surprisingly fun and odd; its misshapen game cartridge, which contained a battery-powered “rumble” feature that added some haptic feedback, was a particularly odd novelty for a Game Boy game.